We’ve seen how fasting and prayer put the Devil to flight. We’ll do no more here then and note the following: The race of demons, says the Lord, is defeated by prayer and fasting. Fasting has to do with the body, prayer with the soul. 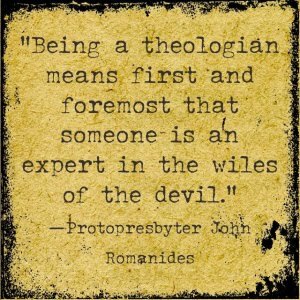 So the whole person engages in the struggle against the devil. Let’s dwell a little on prayer. I would remind you of the famous sorcerer who went to Kolwezi, in Zaire, in 1984, and set about curing people. Father Meletios, the missionary from the Holy Monastery of Gregoriou on the Holy Mountain, who was an eye-witness to the events, tells us what happened. In October 1994, the sorcerer returned to the same town, preceded by a widespread publicity campaign. Banners were stretched over the main streets and loud speakers announced his arrival: “The savior is returning.” They’d also set up a platform on one of the main roads, where the sorcerer would stand. Lots of people hastened to make their way there, to present themselves before him in order to regain their health. The “savior” arrived. There was pandemonium. His timetable was such that he would remain in the town for a week. • On Day 1, he went up onto the platform to heal the sick who were waiting anxiously. He made his prayer. There was no result. Three hours passed and still there was no result. • On Day 2, he made his prayer again. But again he had nothing to show for it. Meanwhile, the loudspeakers on the streets were still blaring his arrival. • On Day 3, he still had nothing to show for his efforts. People began to feel uneasy. • On Day 4, there was still nothing. Now people began to get angry. All hope wasn’t lost. There were still three days left. He did everything he could, but still without any result at all. And then, on the last day, covered in confusion, he was forced to admit to the disappointed crowd that this was the first time that anything like this had happened to him, and that it had happened here, in Kolwezi. Well, what had happened? Father Meletios hadn’t been idle. He’d used the visit of the sorcerer to shame the devil, to benefit the Orthodox Christians and to glorify God. Every time the shaman mounted the platform, Father Meletios and all the Orthodox Christians gathered in the Church of Saint George, chanted the Supplicatory Canon (Paraklesis) to the Mother of God, and read the exorcism prayers of St. Basil the Great. When the famous shaman publicly confessed that this was the first time that anything like this had happened to him, what he didn’t know was that, for the first time, he’d been opposed by the weapons of the Orthodox Church. So the Sacraments are also weapons against magic. “Never go to confession,” he said himself to a sorcerer’s convention. “The thing I’m frightened of most of all,” said the devil, “is what the Christians eat and drink in church, so long as they do so with a clear conscience.” Holy Communion is the most deadly weapon against magic. So if you take Communion, magic won’t affect you. Conclusion: If you distance yourself from sin and live in the Church, with its Sacraments, you have nothing to fear! You’ll never, never, be attacked by magic. The experience of our Church tells us that those who commit sins, especially those of the flesh, are vulnerable to magic. In other words, their sins disarm them completely and they surrender to the appetites of the devil. But if you wear a cross or have relics or a Gospel at home, how can magic affect you? As long as Julian the Apostate made the sign of the cross with unsullied hands, the demons that were attacking him at the behest of a sorcerer disappeared like smoke. But once he’d slaughtered a little child after being told to do so by the sorcerer and had bathed his hands in blood, it didn’t matter how many times he made the sign of the cross. It didn’t work and the demons overwhelmed him. His sin had made him unworthy of divine protection. Therefore, if you commit mortal sins, then neither relics, the cross, nor the Gospel will be of any avail against magic. At the Divine Liturgy, people who are possessed howl, “I’m burning, I’m burning.” What are they burning from? It is from divine grace, which is “emitted,” which wells up, at the Liturgy. Therefore, the Divine Liturgy is fire which burns the devil (and magic). So people who are irregular in their church attendance can be affected by magic. 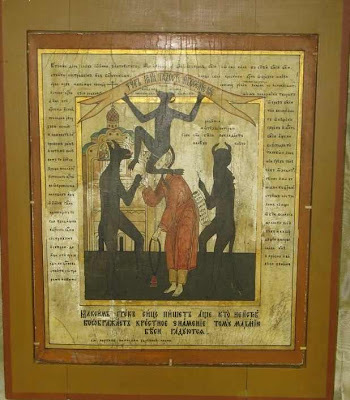 • The devil himself, at a meeting of occultists, forbade them to attend the Divine Liturgy. • St. Macarius the Egyptian told a woman who’d been put under a spell that she was never to absent herself from church. “The magic worked against you because you hadn’t had Communion for five weeks,” St. Macarius told the above woman. So, if you don’t have Communion for a long time, you’re giving the devil a stick to beat you with. “… So that by absenting myself too long from Your Communion, I may not become a prey to the wolf of souls” (from a Prayer said before receiving Communion). • Cut themselves off from sin. • Go to church, confess, and partake of the Holy Mysteries. • Drink blessed water (Agiasmos) every day. • Pray and fast strictly. • Have the exorcism prayers read once a week. “You Cannot Serve Two Masters”(Matthew 6:24). • Those lay-people who “remove magic” and say prayers from our Church. • The fire-walkers who, with the icon of Sts. Constantine and Helen (and the power of the devil!) walk barefoot on red-hot charcoal. • The sorcerer who was killed and the witch who was convicted who had a special room (“oratory”) in their house with icons, incense and magic symbols. • Sorcerers who might give advice to have an unction service read. Why do they muddle up our pure faith with blasphemous, devilish elements? They do it in order to deceive naïve people and gain their confidence. In other words, who (even atheists!) would dare visit them if, in their rooms, they had only skulls? What if there weren’t any icons and incense to be seen? And what if they didn’t advise people to have an unction service read? Are they or are they not charlatans and impostors? Dogs (and pigs) don’t know anything about “holy things”. They wouldn’t know how to use them, to reverence them or to invoke their blessing. Were we to give anything holy, they’d just render it useless. Worse than that, they’d defile it. Here, the dogs and pigs mentioned in St. Matthew’s Gospel are people who behave towards holy things as dumb beasts would. In the case in point, they’re the occultists and mediums who, next to their skulls and pentagrams and such, have holy icons or the Honorable Cross and in this way defile the holy things. They are people who have the holy things as a bait for their innocent victims instead of for blessing and sanctification. They are people, and they are not alone in this, who mix suspect and treacherous words with the words of the Church. What we mentioned above, and every Satanic ritual, is explicitly forbidden by Scripture. And not only that, but “everyone who does such things is an abomination to the Lord.” Anyone engaging in such practices is despicable in the sight of the Lord! Such people are not only impostors, they’re not only profane, but they deny Christ. How can this not be so when, by their “prayers” they invoke the aid of Satan and not that of Christ? As we’ve already said, she does this in order to trap you. St. John Chrysostom adds, “She uses the name of God in order to curse Him." While saying that she’s a Christian, she actually does what the idolaters do! The demons also referred to God but they were still demons. The Lord upbraided them and expelled them. In October 1997, in a neighborhood of Patras, Greece, the following event took place. A family was facing a particular problem and, instead of going to the Church, had recourse to a medium. The medium gave them a little bottle of water and advised them to put it in a corner of a room at home and to get a priest to come and read a blessing service. This they did. In the midst of the members of the family, and of friends and relations, the service of the Blessing of the Waters was read. At the end, the family remembered the little bottle of water that the medium had given them and threw that into the water as well. What was the result? The priest’s metal Cross, which was still in the water, broke in two. God had answered: You can’t be with Him and with the devil. If you are with God and the devil, then you are with the devil alone. Repent! Suppose you go to one of those dens of Satan. Where do you think you’re going? Do you realize that you’re going to those in whom the Lord can’t abide; to those who deny Him, to charlatans? Do you have any idea what you’re doing, and how great your sin is? King Saul was worried about his future fate, so in order to learn something about it, he had recourse to a witch. However, because he did not turn to God at this difficult moment in his life, God punished him with death! We would stress this very strongly: God put King Saul to death precisely because he went to a witch and not to God. Saul believed that the witch would be of greater help to him than the Almighty Lord. He believed in the witch rather than the Lord! If the Lord was so angry with Saul - He put him to death - who lived before Christ, how much angrier will He be with a Christian who does these things when he or she should know better? 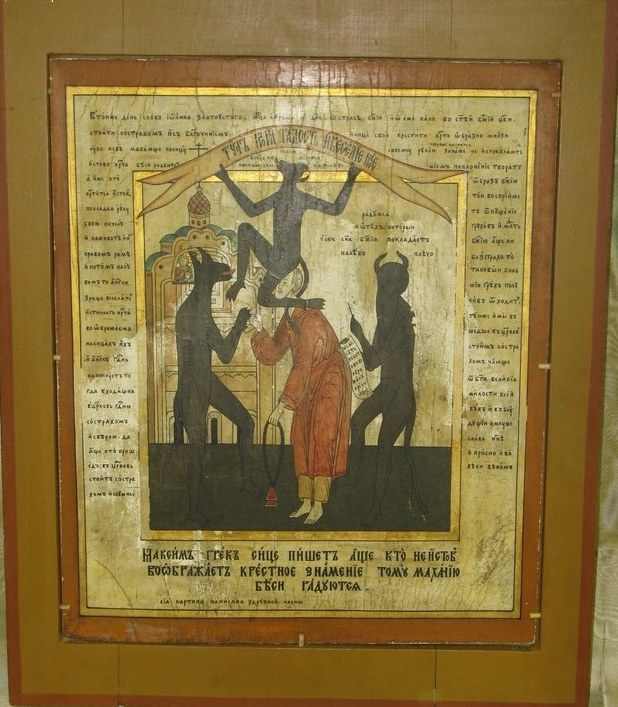 A Christian swears to “renounce Satan and all his pride” (Service of Baptism). Saul spurned God at a difficult time in his life. Well, any Christian who has recourse to occultists of any description similarly spurns the Lord. • These people (Christians!) believe in the sorcerer, the astrologer, the medium, rather than Christ. • They believe that they’ll get more help from charlatans than from the Lord. • They believe in bat’s bones, horse shoes, the pentagram and what not, but they don’t believe in the Lord and His Honorable Cross! St. Gregory of Nyssa puts the Christian who follows “Satanic pride” in the same category as those who deny Christ. They have to do without Communion for at least six years! (Canon 61, Holy Sixth Ecumenical Synod). Those who make charms, which they then wear by invoking the devil, are similarly subject to the same heavy penance: six year’s abstention from Communion. • See then precisely how you walk, not as unwise people, but as wise ones. • Redeem the time, for the days are evil. • Therefore do not be foolish, but understand what the will of the Lord is.